In breast cancer, the antiestrogen tamoxifen has been prescribed for both primary treatment and the treatment of advanced metastatic disease. Although the drug induces remission in most patients with estrogen receptor-positive disease, all patients eventually develop resistance. van Agthoven et al. (1998) applied an insertiol mutagenesis strategy to a breast cancer cell line. Infected cells were subjected to tamoxifen selection, and the resistant clones were screened for a common integration site linked with antiestrogen resistance. By screening a human testis cD library with the integration site-specific probe, they obtained a cD encoding BCAR3 (breast cancer antiestrogen resistance 3). The deduced 825 amino acid BCAR3 protein contains a putative Src homology 2 (SH2) domain and sequences homologous to yeast CDC48. Northern blot alysis detected abundant expression of a 3.4kb BCAR3 transcript in heart, placenta, skeletal muscle, spleen, prostate, testis, ovary, small intestine, colon, fetal kidney, and several cancer cell lines, but not in nonmalignt breast tissue; a 6kb BCAR3 transcript was also detected in skeletal muscle and heart. van Agthoven T, van Agthoven TL, Dekker A, et al. Identification of BCAR3 by a random search for genes involved in antiestrogen resistnace of human breast cancer cells. EMBO J. 1998; 17:2799-808. 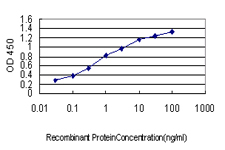 Detection limit for recombinant GST tagged BCAR3 is approximately 0.03ng/ml as a capture antibody. 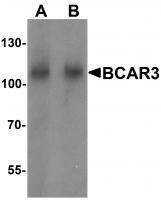 Western Blot analysis of BCAR3 expression in transfected 293T cell line by BCAR3 polyclonal antibody (A01).Lane1:BCAR3 transfected lysate(93 KDa).Lane2:Non-transfected lysate. 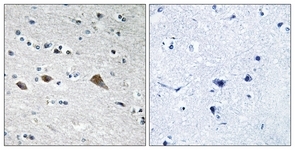 Immunohistochemistry analysis of paraffin-embedded human brain tissue, using BCAR3 Antibody. The picture on the right is treated with the synthesized peptide. 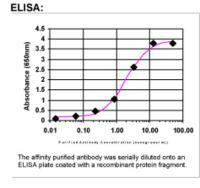 Western blot analysis of extracts from HeLa/Jurkat cells, using BCAR3 Antibody. The lane on the right is treated with the synthesized peptide. TA305647 (0.5ug/ml) staining of Mouse Kidney epithelial cells lysate (15ug protein in RIPA buffer). Primary incubation was 1 hour. Detected by chemiluminescence. 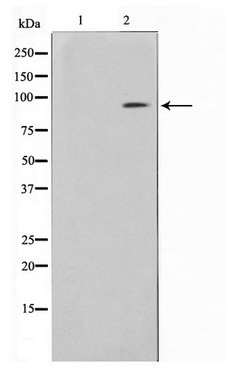 Western blot analysis of BCAR3 in mouse kidney tissue lysate with BCAR3 antibody at A) 1 and (B) 2 ug/mL. Immunofluorescence of BCAR3 in human kidney tissue with BCAR3 antibody at 20 ug/mL.